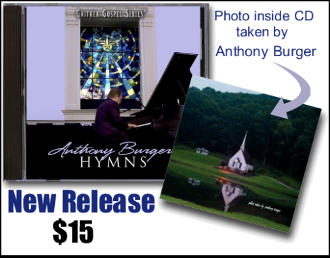 Anthony Burger Productions and Spring Hill Music are proud to present Anthony Burger Hymns. This CD is a compilation of hymns from The Story and The Story Continues discs and is sure to be a treasured collection of some of the greatest hymns of all time. Featured on one CD are songs such as Tell Me The Story of Jesus, The Lord's Prayer, Amazing Grace, Great Is Thy Faithfulness, Just As I Am, How Great Thou Art and many, many other favorites. When Anthony recorded these hymns, he decided to only use the grand piano without any other instrumentation,.. it is recorded just as if he was playing right in your own living room.